Practicing EASA style multiple choice questions as a part of a complete program of study, is the most efficient way to build your knowledge level, and identify the subject areas you need to study further. Practicing the club66pro.com questions will guide you, section-by-section, through the module(s) you are currently studying. It will develop your ability and confidence and much improve your chances of passing the EASA Part-66 exam, whether you are sitting them with the UK CAA, another European Authority or with a National approved Part-147 school, or indeed, any EASA Part-66 equivelent exam anywhere Worldwide. Once you have taken the test, our on-line marking system will instantly mark it for you, and provide book references or a brief explanation of the answer. You can also send us feedback on individual questions, or start/enter into a technical discussion on individual questions in the Tutorial Support forums (if you have included our Tutorial Support service at enrolment). 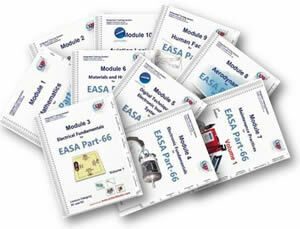 You can study the EASA Part-66 Module-by-Module online, using our very own Study Notes, which open in a window on your screen, fully indexed and paginated. If you do not understand a particular question, the link positiond right under the question will open the Study Notes at the required chapter for you to read. You can also purchase hardcopy and/or eReader versions of these Study Notes at the TTS Bookshop. Then when you are done with that test, you can start all over again, with a fresh set of questions, and repeat again, and again, and again, until you are proficient in the subject, and ready for the Authority's exam.